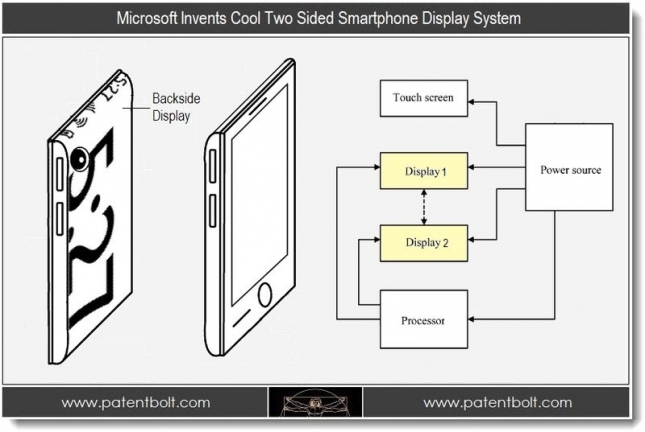 According to media reports, the United States patent and trademark office today announced a Microsoft new patent: two-sided smartphone display system. Through the name we already know, this is a technology about a function that smart phone can shows with double sides. File description as: in back of smart phones and tablet computerthere is a complete, low power dissipation screen can fully display equipment information. Microsoft said in the patent of invention, with the "second screen", hardware manufacturers can remove more small parts of equipments in the design, so as to release more space, also can display all kinds of information not convenient to display in the main screen. In addition, the second screen "will be equipped with independent and low power consumption processor, can reduce electronic load of the screen. Of course, patent invention is just a premise, whether it will become a reality still need time to test. So, how many people are looking forward taht their own cell phones can have double screens?